"Smoke the Mountain Feist at 5 years old. 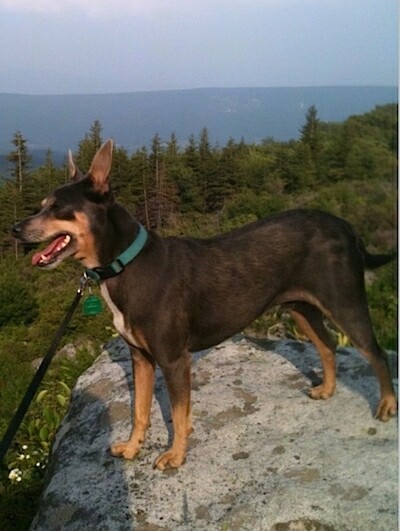 This is Smoke hanging out at Dolly Sods in West Virginia. Smoke gets to run free everyday and loves to chase squirrels and any other creatures he comes across. He's even squared off with a 4 point whitetail." A Feist is a type of small dog developed in the rural southern United States for hunting squirrels and other small game. Most Feists are bred only for their hunting ability and with no intention of turning them into show dog breeds, so there is little or no consistency among these dogs. Only the Treeing Feist has been recognized as an identifiable breed by the United Kennel Club in 1998.